I forewarn you, what you are about to read may upset you. I won’t blame you if you choose not to read it. What I have to say here starts off rather unpleasantly, but it does offer hope and direction for those looking to innovate and try something new. When you do that search you will get this chart. It represents Google Search interest for the term “Chamber of Commerce” by year. The trend line for Chamber interest over the past 10 years is horrible. People just aren’t as interested in Chambers anymore, at least according to this piece of data. Should we just ignore this? Is interest, and therefore relevancy, not an issue to be addressed? Many people in the industry have said it isn’t an issue. Here is another data point, one much less precise, but still informative. Do a Google News search for Small Business Saturday. You will find tons of newspaper stories about it. How many of those articles mention the local Chamber of Commerce, the one who supports small business year round? I went through more than a dozen articles immediately after Small Business Saturday and the Chamber was hardly mentioned. It’s sad. It’s scary, if you love this industry. 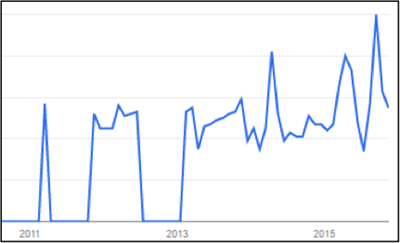 Let’s do a few more business-related Google Trends queries. Content Marketing. The data shows a sustained upward trend for this modern marketing technique. The vast majority of Chambers are doing old school interruptive marketing. Content Marketing provides massive reach into the community at very little cost, yet few Chambers are leveraging this trend. The Membership Economy (started trending after 2011). Subscription and membership economy companies are changing the way we are entertained, buy life’s necessities, purchase software, etc. It’s a massively disruptive shift. In the membership economy, it’s not about a single purchase of a product or service, it’s about creating exclusive audiences and lifetime customers. A core tenant of the membership economy is relationship building. This helps organizations retain their members as the company discovers and serves current wants and needs. Retention, or reducing churn as these companies term it, is paramount. Chambers could learn a thing or two about building online relationships, exclusive audiences, and truly knowing and serving their members’ current wants and needs. 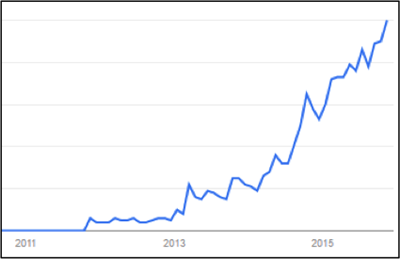 The Sharing Economy (started trending after 2011). People are flocking to companies that save them time, effort, and money. This model lends itself to offering your members and customers solutions at scale. Think Uber, Airbnb, and Kickstarter for your members and community. If you want to grow your budget, the only thing holding you back today is your imagination, as your members are already spending their money on things that your Chamber could be brokering or helping them acquire. The Chamber industry is comfortable doing international travel trips. That is leveraging the sharing economy. Why don’t many Chambers offer the other things members and prospects are paying too much for or things they want and/or need? Your Chamber is perfectly positioned to leverage these new trends. If you want to secure your Chamber’s future, start doing real Content Marketing today. People will be thrilled to get content from the Chamber (and Chamber team) that informs, entertains, and inspires them. Quit interrupting people with what’s important to your Chamber and start providing a lot more value through content that is important to your members and prospects. This is top of funnel work. As for acting like a Membership Economy business, focus not so much on wham-bam inbound lead generation but on building exclusive, proprietary, audiences. 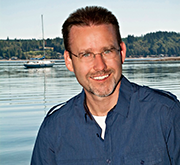 Build those relationships and get to know your members and prospects inside out. Segment your market and build your tribes. This is middle of funnel work. Then, as a Sharing Economy business, offer the product and services that your members and prospects have told you they want and/or need. Solve your segment’s specific problems. When you do, you become indispensable. This is where the conversion happens, at the bottom the funnel. It sounds simple enough, but it isn’t. Truth be told, your Chamber should have started this years ago when content marketing, blogging, and permission marketing went mainstream. If your Chamber doesn’t have a blog or similarly interactive platform where you provide value without pushing your own agenda items, you aren’t doing content marketing. If you are not segmenting and growing your exclusive online audience, you aren’t truly getting to know the wants and needs of your members. You aren’t leveraging the Membership Economy. 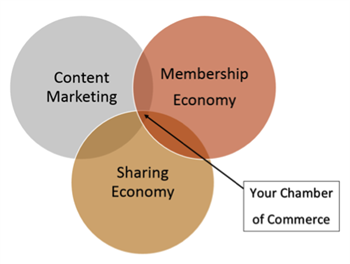 Finally, if your Chamber is not delivering products and services that your segments ask for, or already buy somewhere else, you aren’t leveraging the sharing economy to the benefit of your members and community. Don’t feel this is the right time for your Chamber to leverage these disruptive trends? Waiting for the case studies to help your organization avoid any potential pitfalls?